Adi Shankar will be producing the project. 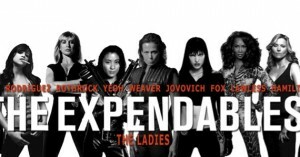 “I don’t know how I’m supposed to make a movie that is supposed to be the female version of ‘The Expendables’ without Gina Carano in it. It would be like making Twix without caramel or Jamba Juice without jamba,” said Shankar, whose shingle recently co-produced Joe Carnahan’s “The Grey,” Pete Travis’ “Dredd 3D,” Andrew Dominik’s upcoming Brad Pitt-starrer “Killing Them Softly” and the viral Internet hit “The Punisher: Dirty Laundry,” starring Thomas Jane. Carano is a badass, but her acting needs a little work. Who would you cast in this epic female ‘Expendables’ film? This entry was posted on Tuesday, September 25th, 2012 at 12:24 am	and is filed under Film, News. You can follow any responses to this entry through the RSS 2.0 feed. You can skip to the end and leave a response. Pinging is currently not allowed. « Guess Which Coen Bros. Film Is Becoming a Series?!?!? Your destiny can be your doom. Look at me and my Rick.